Traveling from Pomona, CA with a car loaded to the gills with clothing, household goods, two dogs plus Doug and myself was long and oh so very interesting! We were fortunate to visit with my brother, David, and sister-in-love, Evelyn, in Mesa, AZ. Evie cooked an old family favorite for us, Sopa de Fideo (comfort food!) Thank you Evelyn! 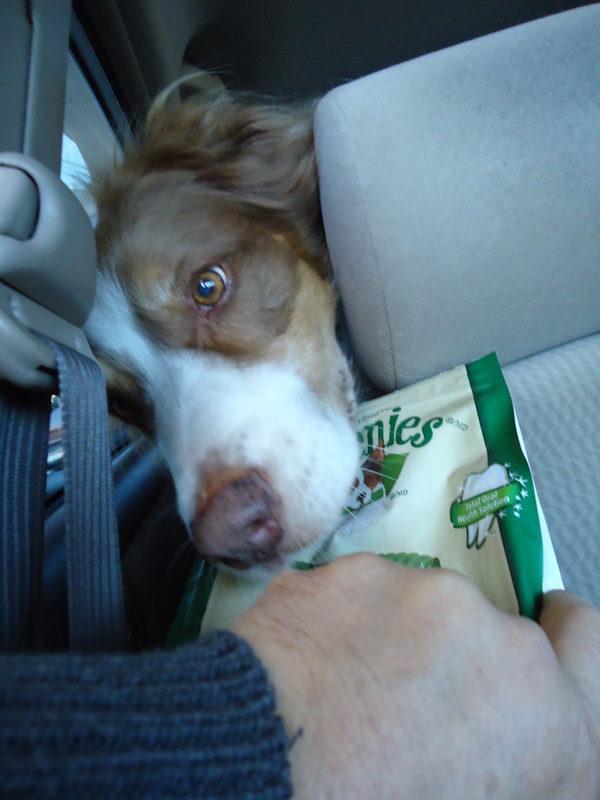 Before crossing into Mexico, Ozzie somehow managed to eat all his – and Minnie´s- “Greenie” treats in one stretch of the drive. How he managed to do this without our noticing and without destroying their bag remains a mystery. which turned out to be quite easy and relatively quick (2+ hrs to get paperwork completed—car and visas.) We loved the scenery and the blooming plants provided color and fodder for our imaginations (purple sage subject for later entry.) The roads were good in Mexico (we mainly used toll roads) and traffic was light. Having been advised by EVERYONE not to drive at night, we opted to spend the night in Matehuala at a wonderful resort called Las Palmas. We plan on taking visitors to this great place where Brad Pitt!!!! stayed while making the movieThe Mexican. After a leisurely breakfast we departed for San Luis Potosi! Welcomed by caretaker Alma and her son, Gustavo (Gus, pronounced “Goose”) we unloaded the car, let the dogs run and began unpacking. Gus accompanied us to the Walmart nearest us, which turned out to be not a Walmart, but a Mexican store Bodega Aurrera where we proceeded to buy lamps, cleaning and laundry supplies, dog food, drinking water, etc. etc. etc. With the trunk filled and half of the back seat, we started the car. Click. Okay, we TRIED to start the car. A kind stranger found battery cables and a car capable of giving us a start, and we were once again on our way. Gus asked if we wanted to go through the village/suburb where we live to get familiarized with it, and we agreed. While driving through the business district, the car died again. Kaput! Doug pulled over into an available parking space and we pondered what to do. Just at that moment, Gus cried out “Mi Papa! !” as a man on a motorcycle drove by. He jumped out of the car and whistled for his Dad, who is a mechanic! The battery was deader than a doornail. Finally Joel (pronounced “ho el”) took the battery out of their van in order to get our Corolla back to the house. He was able to get us a new battery the next day. Two thousand miles driven on a battery that was near death! And it died just as the person most capable of helping us randomly drove past! If Doug and I did not already know that God had called us to this place, the timing of the failure of the battery and Joel’s ready assistance would have made us sure of our call.Truly a miracle (MILAGRO!) We took Alma, Joel, Gus(12), Zabde(8), and Elias (5) to dinner on us. What a first night! God is Good! All the time!